(CNS): Visiting UK counsel, Simon Russell Flint QC, closed the murder case against Leonard Antonio Ebanks on behalf of the director of public prosecutions Monday, three weeks after the trial opened. Ebanks is accused of murdering Swiss Banker, Frederic Bise, as part of a joint enterprise with Chad Anglin back in February 2008. The crown’s case agaisnt Ebanks depends heavily on alleged confessions the West Bay man made to two different women some two years apart. With no further live witnesses, the crown concluded by reading to the jury a list of agreed facts about the case, from the details of how Bise's car was burned to the conviction of Anglin in April this year. Anglin was seen on CCTV with Bise at a local West Bay bar and witnesses saw the two men leave together hours before his body was discovered in the boot of his own burned out vehicle parked in the driveway of the house he was living in at the time of his murder. Although Anglin’s DNA was also found on cigarettes at Bise's home and in his car, no forensic evidence has been submitted against Ebanks and there are no phone records to show any contact that night between Ebanks and Anglin. (CNS): Government officials have confirmed that a senior member of the immigration department has been suspended from her job as a result of allegations that she has not complied with labour and immigration laws in connection with her own private businesses. Although government has not named the person concerned, CNS can confirm that Kimberley Davis, the director of boards, is under investigation. Davis is responsible for the administration of the department’s various boards, including the Work Permit Board, the Business Staffing Plan Board and the status and residency boards. The Home Affairs Ministry did not reveal any details in an email confirming the investigation at the weekend, as it said the enquiry was still in its early stages. However, Davis has been on required leave with full pay since early November, when the formal internal investigation began. 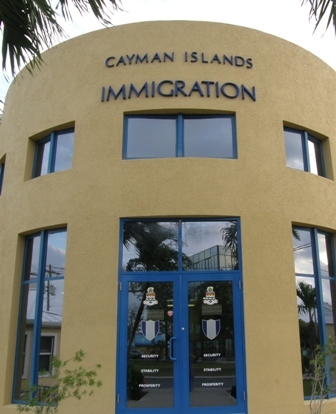 The Anti-Corruption Commission confirmed it was not involved in the probe into the senior civil servant but Wesley Howell, the deputy chief officer in the premier’s home affairs ministry, said that an investigation into alleged conduct of a staff member of the Immigration Department who have may breached the laws of the Cayman Islands was underway, but he did not state if the police were involved. The allegations against Davis are believed to relate to her own permit applications and her compliance with health insurance and pension payments. The probe comes at a time when the immigration department’s board continues to come under fire for the approval of permits at a time when significant numbers of locals remain unemployed and in circumstances where many believe the boards are not properly scrutinizing the applications and allowing employers to manipulate the system in favour of cheap labour over Caymanian job applicants. (CNS): A number of UCCI students were among a group of five young people arrested near the university last week following a police drug bust. An RCIPS spokesperson said that three girls and two boys, all aged between 17 and 22, were arrested in the bushy area between Burger King on Walkers Road and the college campus in George Town on Thursday around lunchtime. It is not clear if the young people were attempting to sell drugs and police have not revealed the quality of ganja recovered during the raid, which took place around 1pm. The youngsters were arrested on suspicion of possession of ganja and a drug related utensil. All five were bailed to return to GTPS at a later date. (CNS): The former president of the UCCI, who is charged with stealing more than a half million dollars from the college, is struggling to find a lawyer despite being three months away from his trial. Hassan Syed, who voluntarily returned to Cayman earlier this year after he was arrested in Switzerland, told the court Friday that he had contacted almost a dozen lawyers to represent him but had failed to secure the services of any of them. Syed was on the run for almost five years after allegations came to light that he had used a government credit card to buy jewellery and pay for lavish weekends away. In October he parted company with James Austin Smith, the lawyer originally representing him. Syed told the court he had come back to face the music because of a guarantee that his human rights would be protected by the governor. However, the former UCCI boss and IT expert implied Friday that they were somehow being breeched. Syed also said that he had not received any directions from the crown about the evidence against him or the necessary papers. The court heard that the papers had, however,been served on Syed's former lawyer, Austin-Smiith, who was in the court and able to assist. He confirmed that he did have the documentation, but for reasons which were not revealed to the public courtroom, Austin-Smith said he “was not keen” to give them to the defendant, having come off- record. He said, however, that he had spoken to another local defence attorney, Richard Barton, who, according to Syed, was considering taking the case. Toyin Salako, the crown’s counselin the case, noted that the circumstances were all rather unusual and denied any breech of Syed’s rights. She said the crown had served the necessary papers but the defendant’s issues with lawyers were his to resolve as a trial date was set for 13 March, a date which the crown was not willing to move. She noted that despite facing some thirteen counts, he had not yet answered the charges on the indictment. Given what appeared to be an impasse, the judge asked the Office of the Director of Public Prosecutions to file a new set of appropriate documents to Syed, who was bailed to return to the court on 5 December, in order to confirm new representation. Justice Charles Quin, who was presiding over the Grand Court mentions Friday, urged Syed to begin reading the papers as soon as he received them and secure the services of a lawyer. (CNS): Three men acquitted in the Cayman National Bank robbery case who were seeking bail Friday remained in jail following a hearing before Justice Malcom Swift. David Tamasa and George Mignot, who have been in prison for more than two years, were refused bail, even though they were acquitted of the bank heist by the Court of Appeal last month. The men are now scheduled to face a new trial starting on 28 January and were remanded in custody until then. Meanwhile, a third man convicted of being the decoy in the case will have another chance to apply for bail after his hearing was adjourned. Rennie Cole was serving a nine year sentence for his part in the armed bank heist. 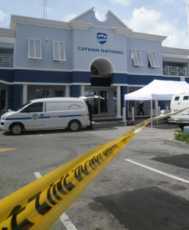 He is a Jamaican national who was in Cayman on a work permit when he was charged with the robbery. He was convicted of being the decoy who distracted the bank guards ahead of the robbers bursting into the bank but he was also acquitted along with three other men by the court of appeal last month and will now also face a new trial in January. (CNS): A former RCIPS police officer, who was on the payroll until last week, has been convicted of murder in Jamaica and jailed for 25 years. Tyrone Findlay was found guilty alongside another former Jamaican police officer, Leonard Lindsay, of shooting and killing a manin 2010 when they were serving in the Jamaican police force in the district of Manchester and supposedly investigating a robbery. Findlay was recruited into the RCIPS in 2011 and in a shocking revelation it is understood that he was serving in the armed unit, despite the allegations. He was formally suspended from the RCIPS just a few months later on full pay, but despite enquiries made by CNS to the RCIPS about the issue, we have received no comment from the local police as to how this came about. Other police sources, however, told CNS that Findlay started working here as a full time police officer earlier this year, even though he was facing murder charges for shooting Anthony ‘Tony’ Richards in Alligator Pond on New Year’s Day 2010 while on duty, in what was said to be an execution style killing. Although the RCIPS has not responded to enquiries made by CNS, David Baines, the police commissioner, did speak to The Cayman Compass and told them that Findlay had received “exemplary references from senior law enforcement officials in Jamaica” prior to being hired in Cayman. The top cop also denied knowing about the charges when Findlay was recruited to the local armed unit and given access to a gun. However, once the revelations about the killing came to light and Findlay was charged, he was suspended and remained on the payroll with the RCIPS even though he had been on staff less than three months. Baines told the local newspaper that the government was obliged to continue paying him. Having been suspended from duty just two months after he was recruited here, he was eventually put back behind a desk this year in a non-operational role until his trial, according to Baines. This was said to have been an effort to get some value for the public purse, which had been paying the officer not to work for almost three years. Baines did not say why the officer could not be sacked in the wake of the charges against him, given the circumstances and the fact that he was still in his probationary period at the time.